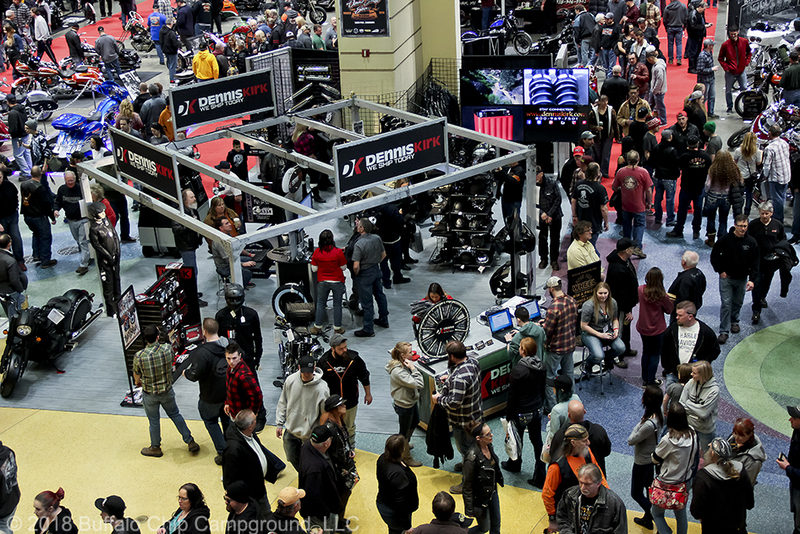 Gearheads are ready to say goodbye and good riddance to winter and swarm into the St. Paul RiverCentre March 23 and 24, 2019 for the Midwest Extravaganza known as the Donnie Smith Bike & Car Show. 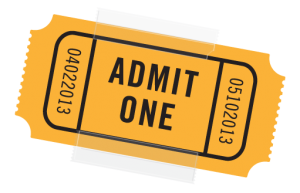 After getting a jumpstart a day early with the War of the Twins II, the return of the popular Indoor Flat Track races at the Lee & Rose Warner Coliseum on Friday March 22, it seems more folks than ever are ready to welcome riding season. 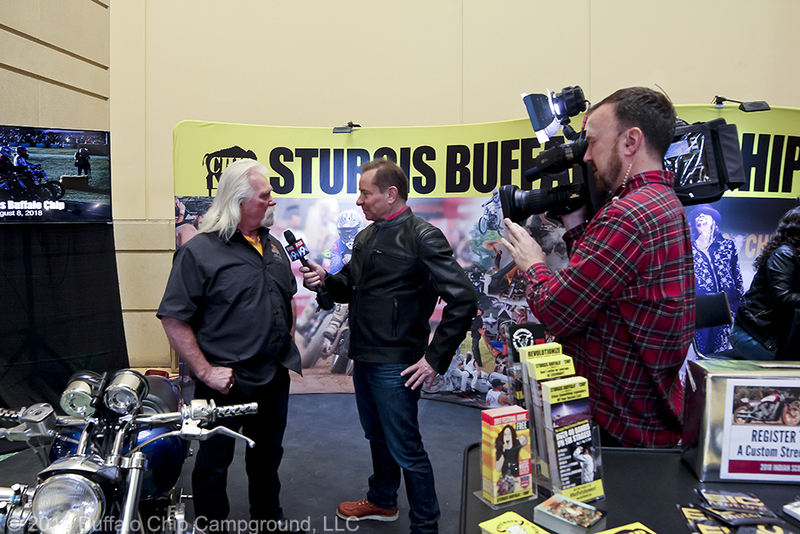 The Sturgis Rider News® article Donnie Smith Show and War of the Twins Kick Off 2018 Riding Season takes you inside last year’s three day moto mania to show you which custom motorcycles and cars came out on top, where attendees found the most fun and why the whole scene was so alive with race buzz that nobody wants to miss the 2019 action. 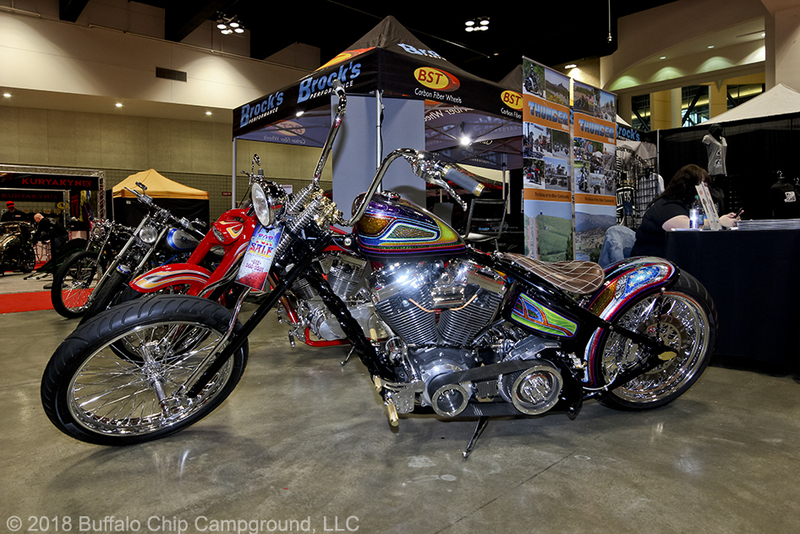 from the atrium, people could be seen walking the bike show floor and taking a turn spinning the prize wheel at the Dennis Kirk display. 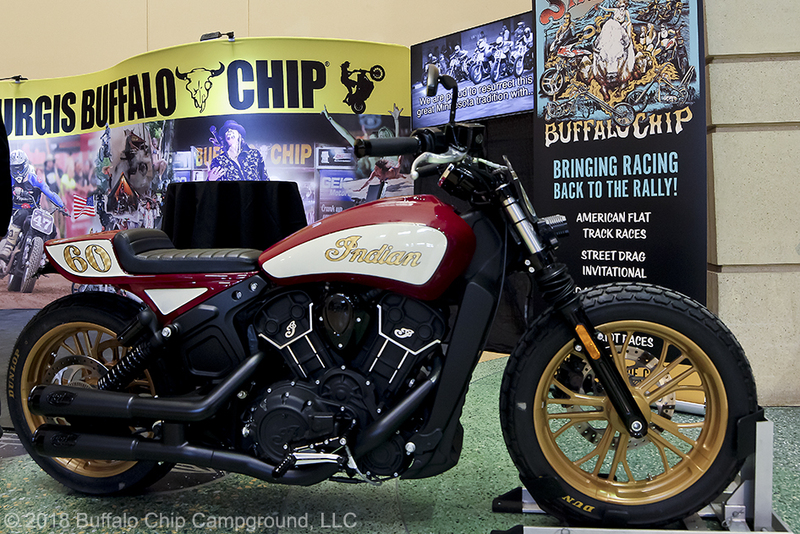 Once down on the bike show floor, those still riding high on the excitement from the War of the Twins races got to feed their need for speed in Sturgis Buffalo Chip® display. 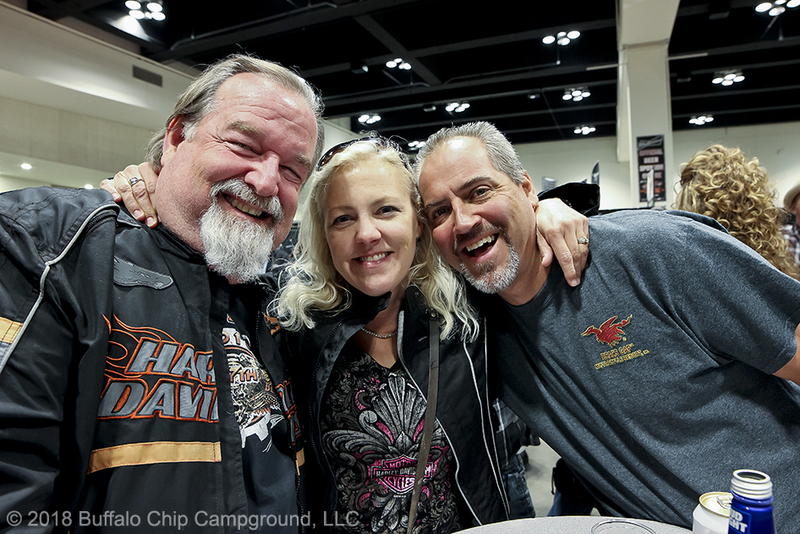 Show attendees learned about the Buffalo Chip’s Moto Stampede® race and concert series and got to check out three different race machines. For many, this was their first encounter with an Indian FTR750, the purpose-built racing machine ridden by the Indian Wrecking Crew in the American Flat Track series. While the FTR750 is only available to the pros, anyone who rides on the track or the street could saddle up on this custom street hooligan. 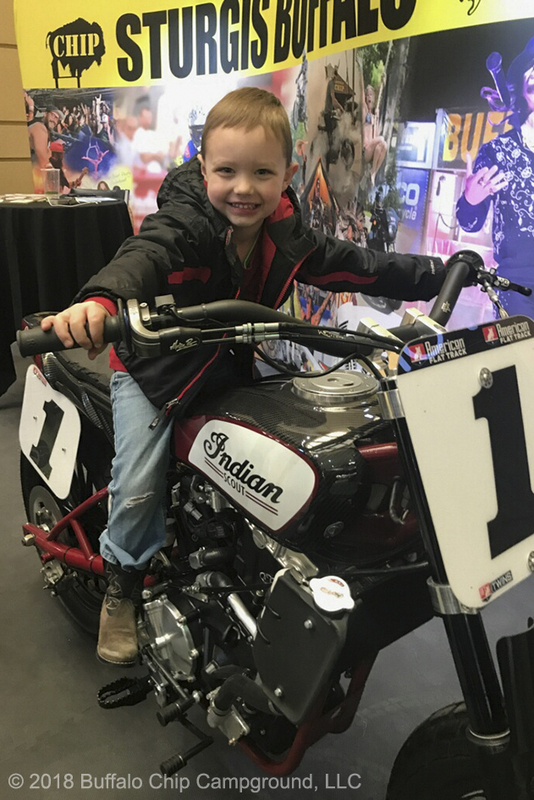 Many hoped to bring home this Indian Scout Sixty from the Buffalo Chip and GEICO Motorcycle by registering to win it through the Moto Stampede Bike Giveaway. 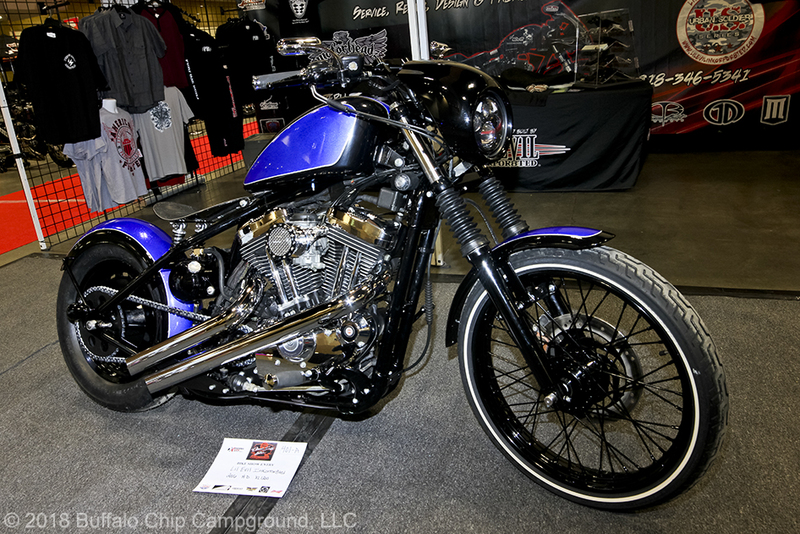 Crazy John Markwald’s beastly 550 hp street bike, which races in Buffalo Chip Street Drag Invitational, drew the attention of speed freaks and the media. Of course, a trip to the Donnie Smith Show wouldn’t be complete without stopping to get an autograph from the man himself. This Donnie Smith original was a favorite in the display, stopping many dead in their tracks. 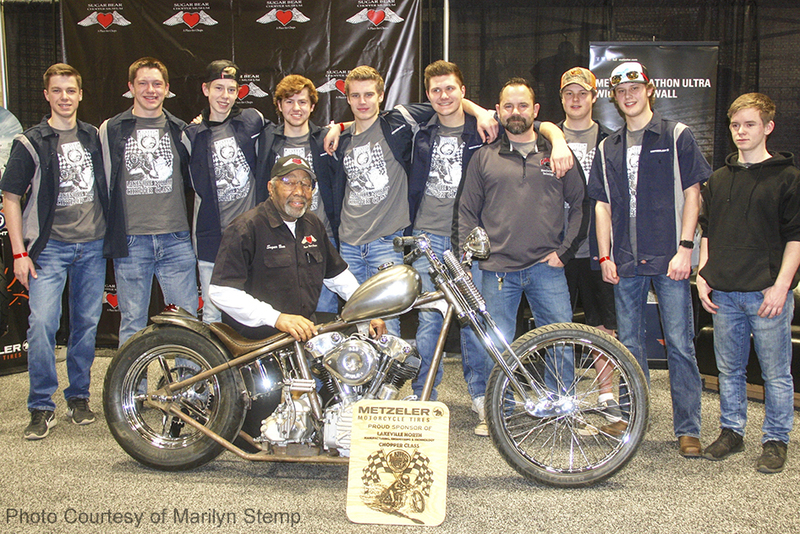 Current and future chopper-building legends met up at the Metzeler Motorcycle Tire display on both days of the show, with Sugar Bear and Kevin “Teach” Baas showing off an in-progress bike from Teach’s Lakeville North High School class that features a Sugar Bear Choppers front end. 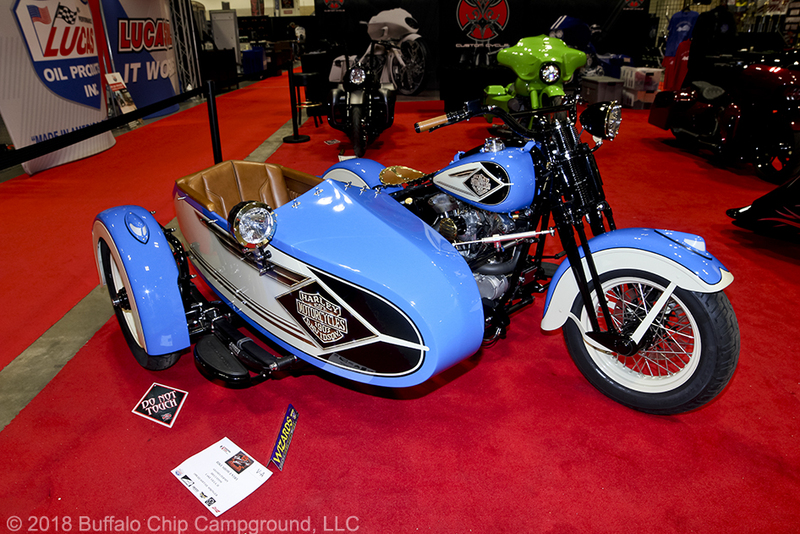 Some folks save the best for last, but it’s pretty easy to get sucked by the pros’ custom motorcycles right off the bat. 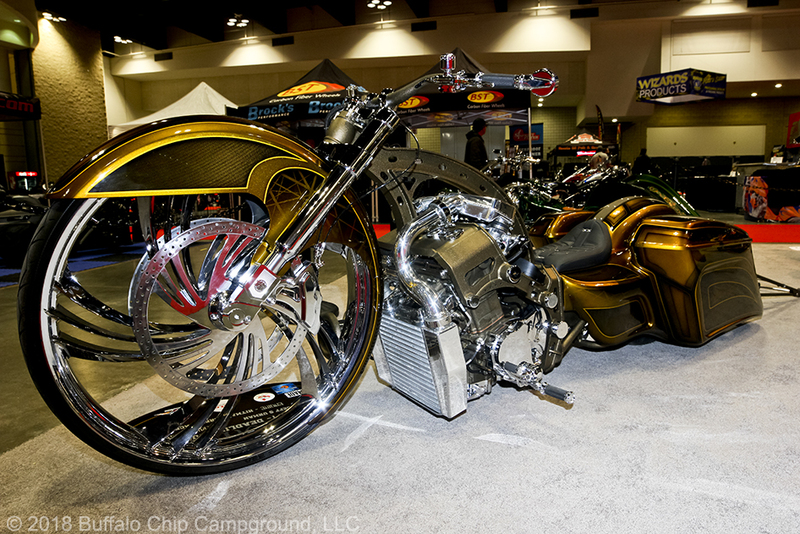 “Gilbzilla,” the aptly named mutant 2005 blown twin cam HD Softail from Gilby’s Street Dept, took 1st place Pro Class Custom. Dan Rognsvoog of Cabana Dan Customs never disappoints, and this turbo digger was no exception. 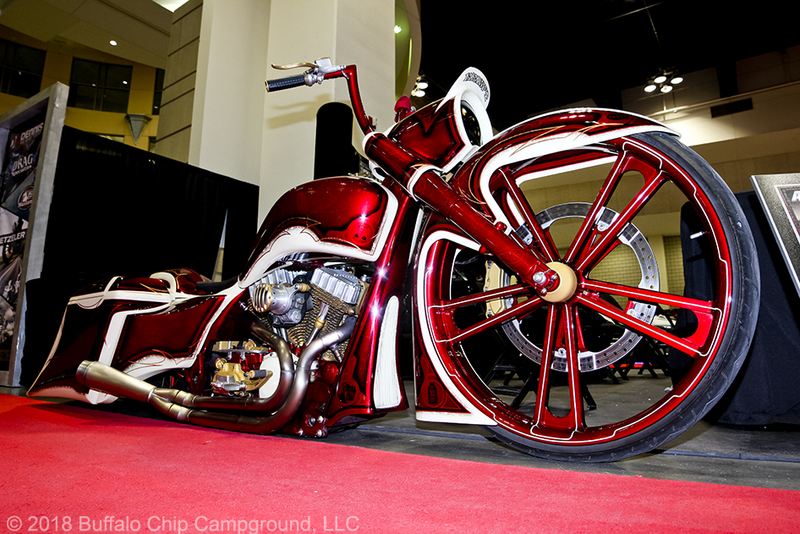 This big, bold, beautiful lay frame Road King from Curly’s Inc. brought home 1st place Baddest Bagger. Well deserved! 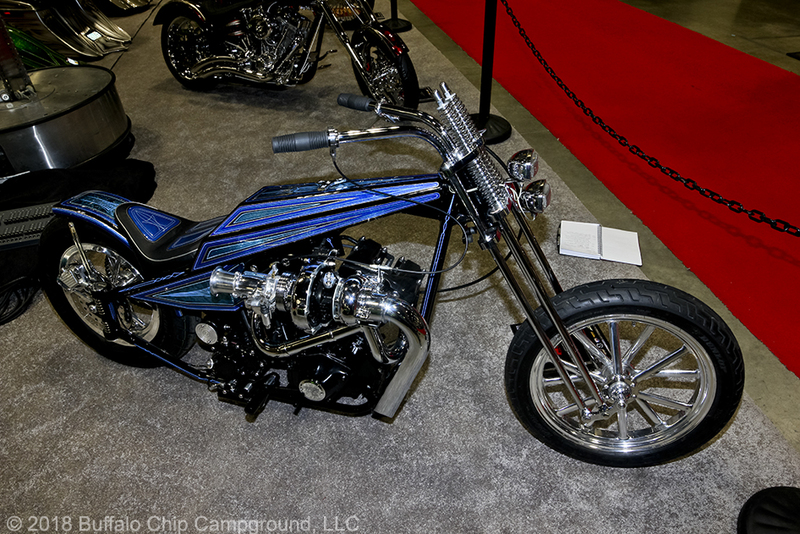 Photos just don’t do this bike from Joe Kresnyak of Black Sun Designs justice. 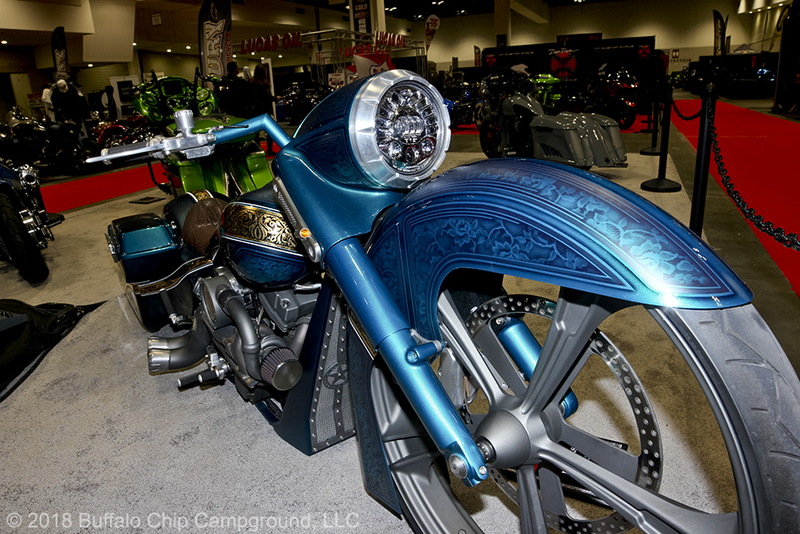 Fifty-two airbrushed pieces carried its intricate Queen Anne’s Revenge theme throughout the whole bike, with the exception of its gorgeous engraved and gold plated rocker boxes. Dana Halberg of Deadline Customs definitely outdid himself with “The Goat.” 150+ custom parts including one-off 32” MAD wheels, Pingel wheelie bar, and Erector Set-style frame sure made us look twice. Not to mention the Hayabusa mill and big ol’ Garrett Turbo delivering over 600hp. Dang. 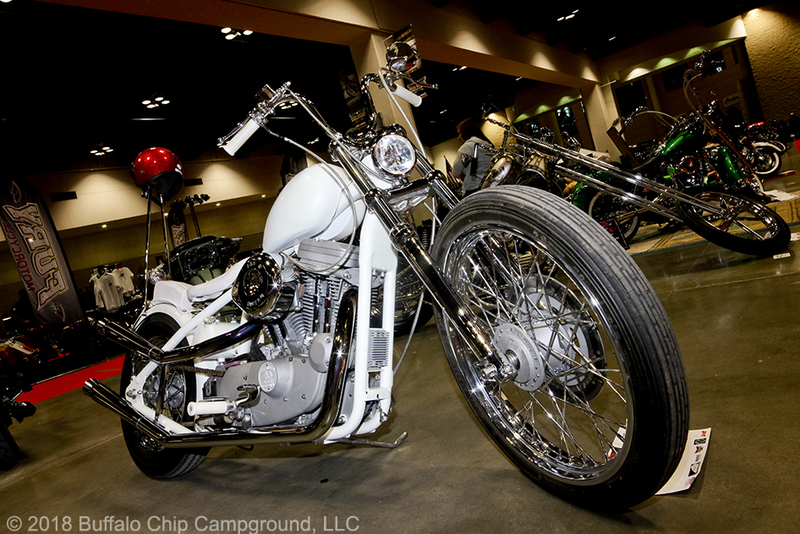 One of only a couple sidehacks on the show floor, this beautiful knucklehead Springer Softail from Dave Dupor of DD Custom Cycle brought home 1st place Open Class Antique. 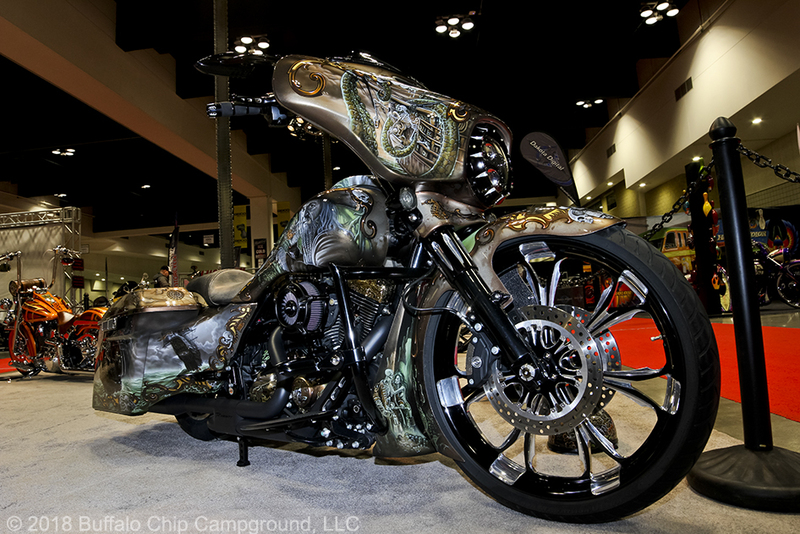 A couple of over-the-top creations caught our eye in the Urban Bagger/American Bagger booth including this lay frame painted with over 25 distinct images from Kory Souza Originals that ended up landing Judges Choice. It’s a good thing this rad HD XL 1200 from Lil’ Evil Inkorpor8ted didn’t have the keys in it, or we might’ve ridden off with it. It took Sportster Street 1st place. Even for a rat bike, Jeff Smith’s ’71 CB750 was pretty surprising. 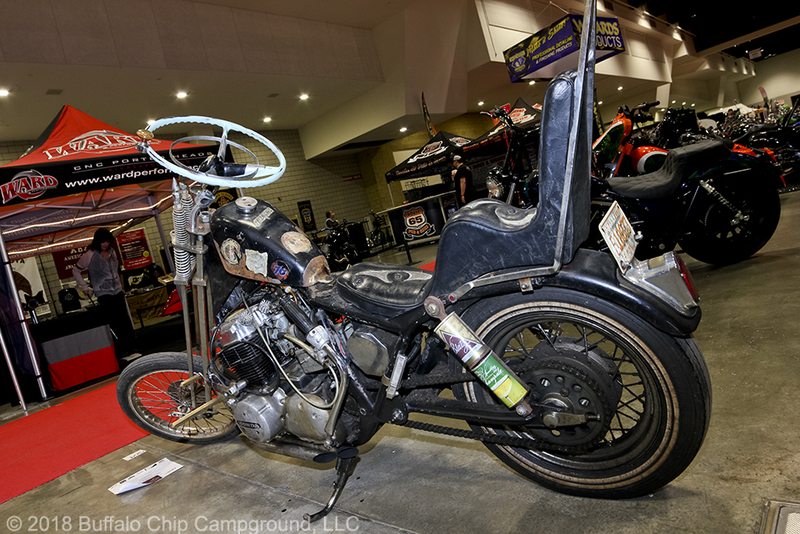 It’s not every day you see a steering wheel, foot throttle and suicide shifter-mounted clutch. Of course, you gotta love the Hamm’s can fuel cap and Schlitz “suspension covers” too. Every inch of Brett Myhre’s ‘72 CB750 was dripping with ‘70s flair, from the classic Harman spirder all the way to the velvet-upholstered seat. 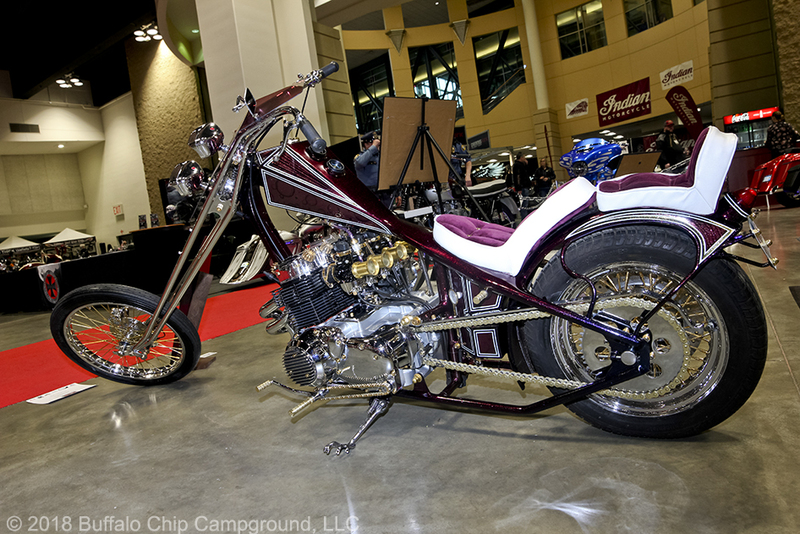 Nick Cramer has had a hand in creating some pretty amazing custom motorcycles that have shown at Donnie Smith over the years. 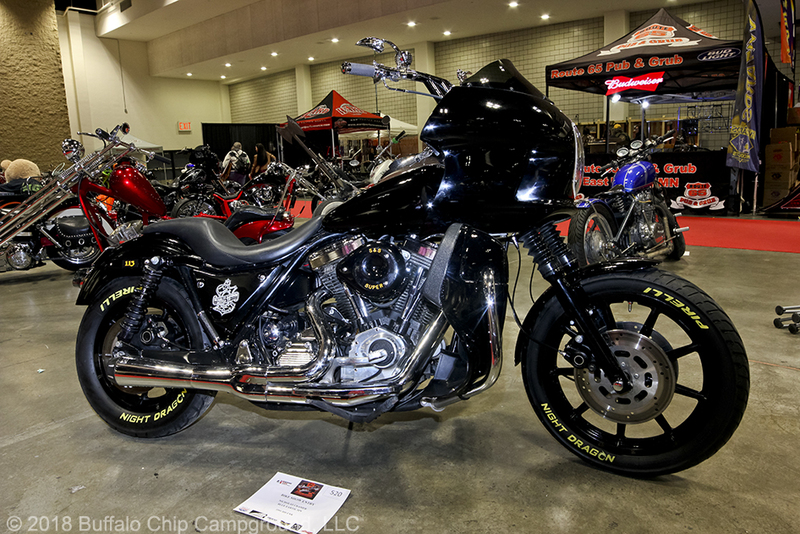 We’re a big fan of the super clean ’91 FXR he brought this year. Greg Lew is all about keeping it classic on his panheads. 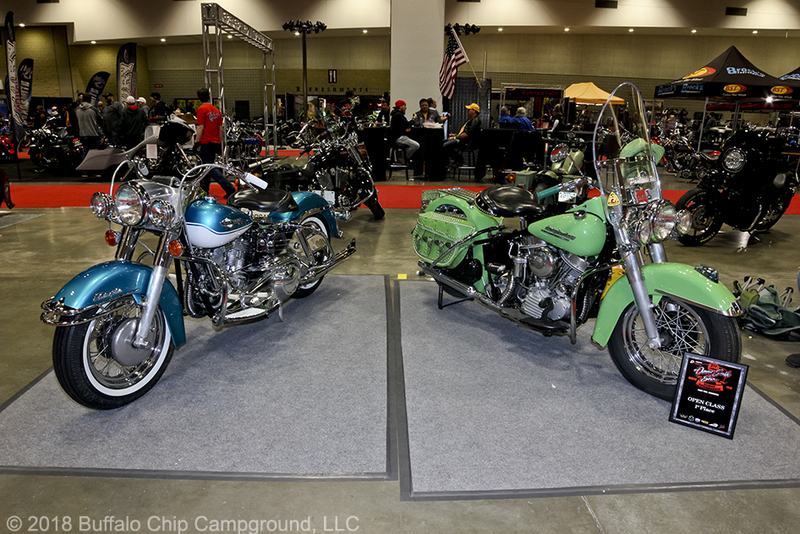 Best Antique went to his 1965 (left) and 1st place Pan/Knucklehead Mild Custom went to his original tropical green-painted 1952 (right). Anyone fighting for survival would be lucky to have Alan Hassler’s ’82 Yamaha Maxium with its paracord grips, .44 Mag topped and paracord-wrapped hand shifter, and ammo case bags. 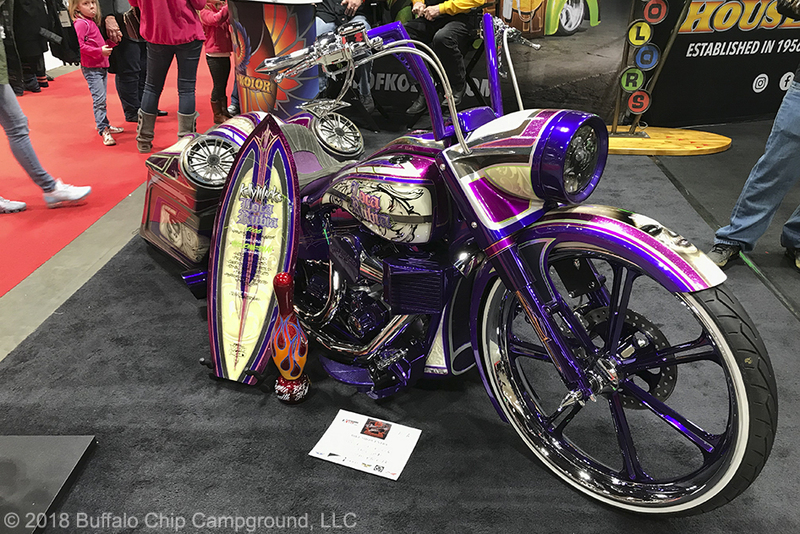 Savannah Rose of S&S Cycle originally built this short chop Sporty in her kitchen for the Sturgis Buffalo Chip’s 2017 Motorcycles As Art™ exhibit, Old Iron – Young Blood, curated by Michael Lichter. Hats off to her for winning 1st place Open Class Custom Sportster on her first full build at her first ever Donnie Smith Show. What’s your daily rider look like? 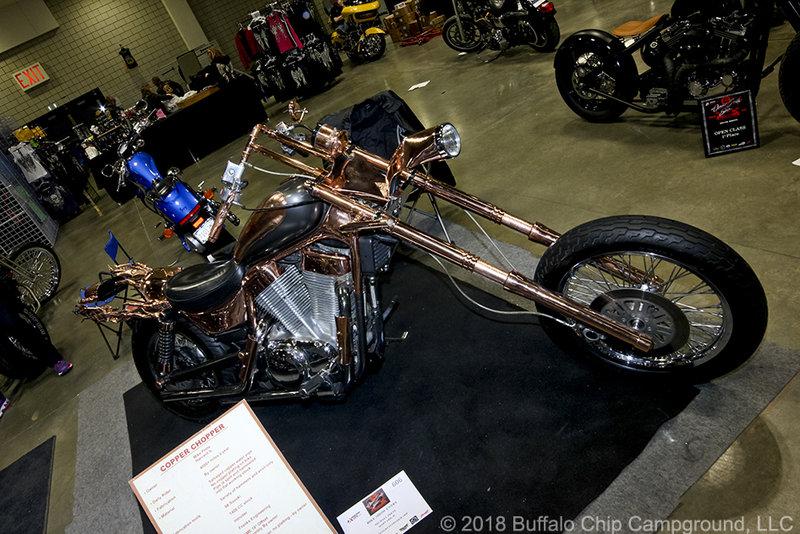 It is if you’re Michael Prete, it looks like this ridiculous chopped copper Suzuki Intruder built from salvaged copper water pipes. 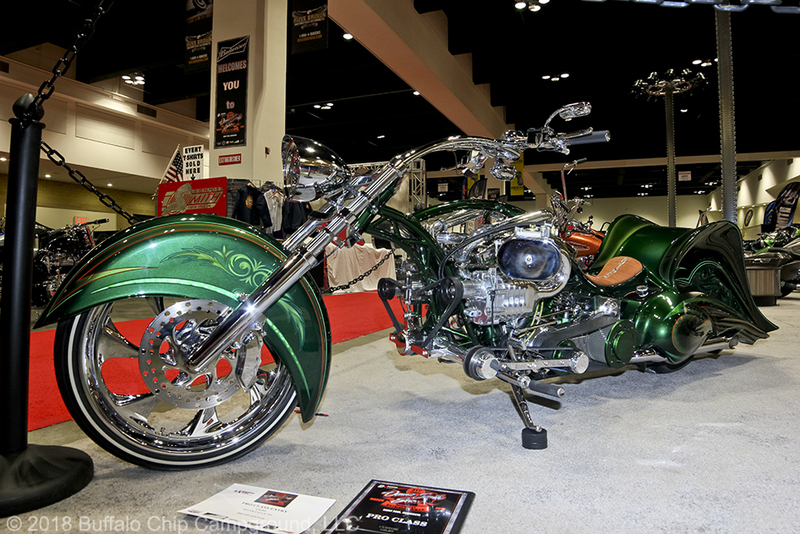 Flea from House of Kolor hit one out of the park with this Road King he painted for his wife. 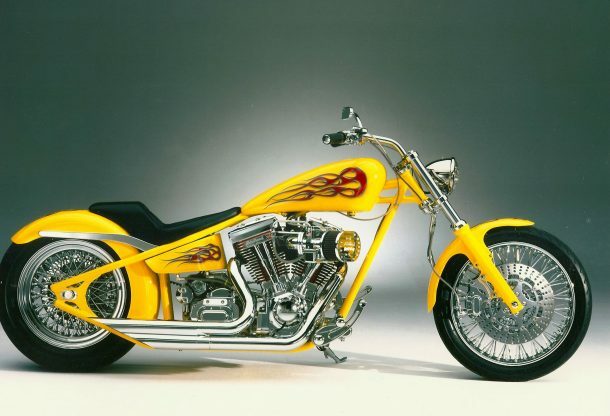 “Loca Rubia” or “Crazy Blonde” drew the attention of Dave and Jody Perewitz with its variegated gold leaf, silver leaf, ultra-fine pinstriping and the beautifully airbrushed faces on its front fender and tail. It took home the Perewitz Pick. We knew Paul Dotten’s ’83 Caddy Coupe had some insane hydraulics. Luckily he was nearby when we took this shot to give us a demo. The thing can practically do a backflip. This ‘63 Buick Riviera was absolutely mint—an impressive feat after being stolen from one of the Donnie Smith Show coordinators and completely trashed. It’s the finishing touches that always make Jeff Fenske’s cars stand out to us at this show. We loved the patina on this ’72 Mercedes 220 as well as its bullet shell trim and lock mechanisms. Built in just 30 days on a $3000 budget, ITW Hot Rod’s “Bugly” proved necessity is the mother of invention by combining a ‘64 Beetle front end, ‘37 Chevy Humpback rear and ‘65 Buick portholes on the hood. The inside is equally as interesting with a ‘58 TS10 470 Continental Cessna Motor, a monster 700 R4 engine, a boat throttle to control each carburetor, rear air ride, a custom built tube frame, and right-hand drive. So much beautiful detail on this 1960 VW Double Cab named “The Black Pearl.” The original factory body was decked out with hand-painted pearlescent graphics, and its custom ostrich leather interior just begged you to get inside. It’d be easy to stare at this 1950 Mercury from Cavan Lasch all day. The pearlescent paint totally played tricks on your eyes, making the color change from deep blue to rich purple. This ’59 Caddy convertible named “The Gambler” had us betting on red with its HOK custom fade topped with Roulette Red Kandy Shot, spoked red wheels, custom red paisley upholstery, and custom fab fiberglass console featuring an airbrushed mug shot of Frank Sinatra. A GM front end, Dana 44 rear end and custom-built one-piece box with shaved handles made up the ultra cool Corvette Silver exterior of this 1950 Chevy pickup. 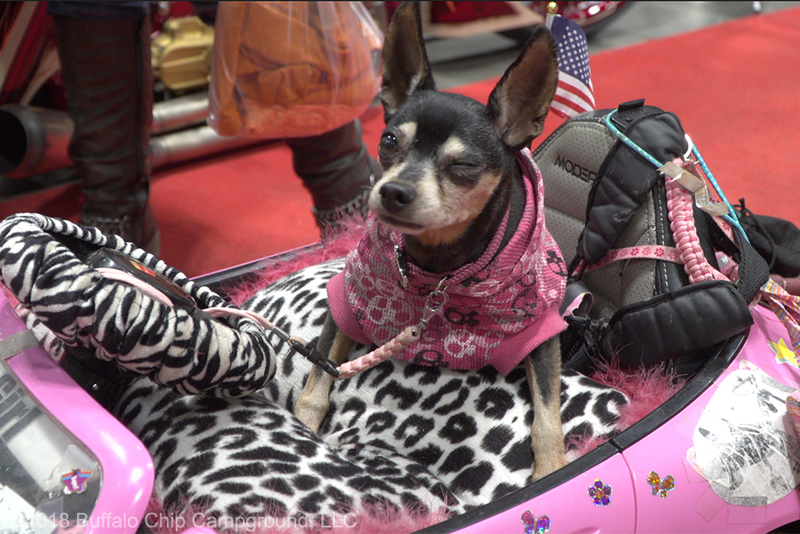 Although not an official show entry, a tiny remote-controlled pink Corvette piloted by a paraplegic therapy dog named Tia Marie deserves an honorable car show mention, as it turned just as many heads on the show floor as the competing cars. 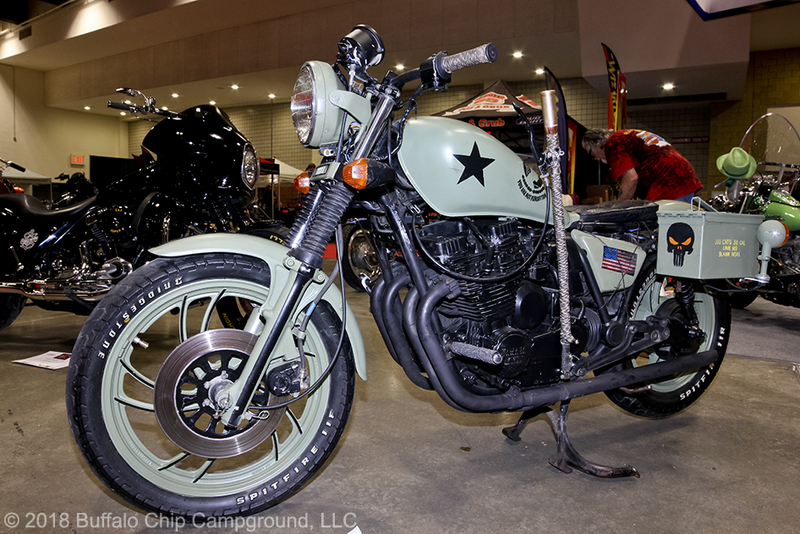 Bikes and cars may get main billing at the Donnie Smith Bike & Car Show, but the Parts Extravaganza, Tattoo Expo, Budweiser Happy Hour and vendors alone make this show worth the trip. 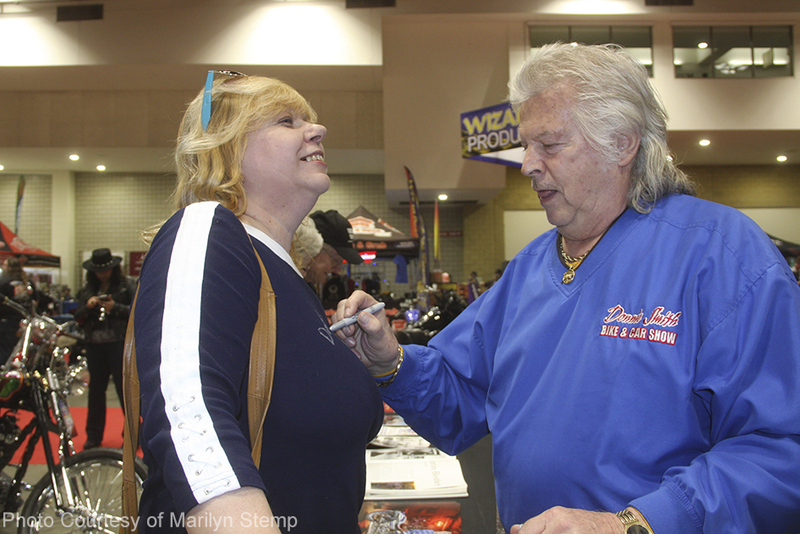 The Tattoo Expo, held on the 3rd floor of the RiverCentre, grew considerably for its second year. 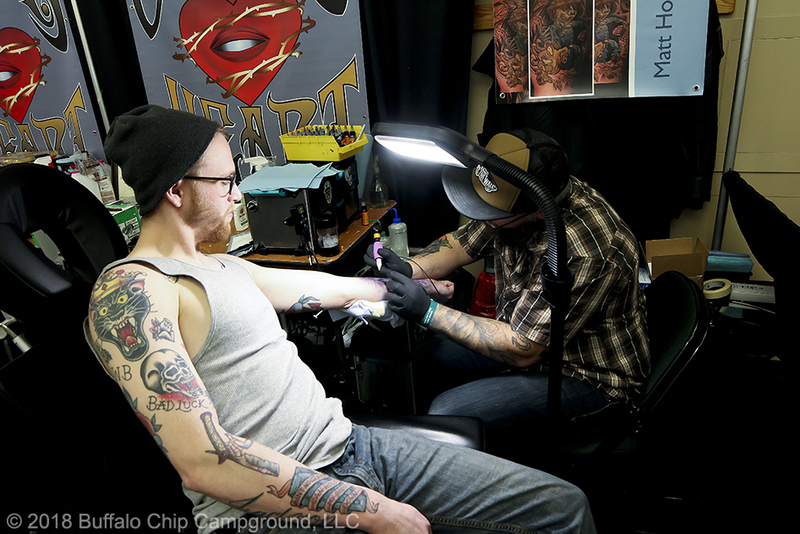 The 30+ participating tattoo artists stayed busy throughout the two days inking attendees at their booths. 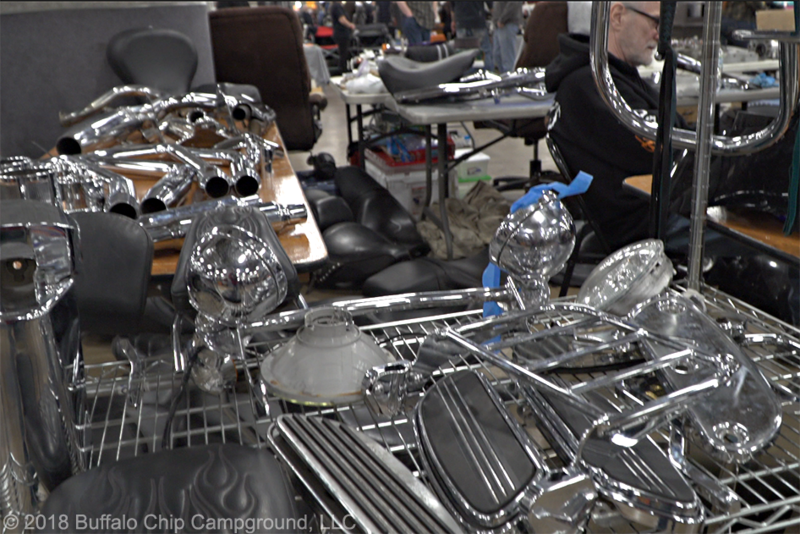 Judging by the number of parts from the swap thrown over shoulders on the show floor, there’ll be plenty of tinkering down in the coming months. The Budweiser Happy Hour was extra bumpin’ this year…perhaps fueled by the round of 50 beers show promoter Neil Ryan bought at its start. As we headed down the road the day after the show, an impending snowstorm was quick to remind us it could easily be another month before riding season fully took off. But with our cameras full of photos and our heads overflowing with inspiration, there are enough good memories to ride it out. To find out more about the War of the Twins Indoor Flat Track races that took place Friday, March 23, 2018, check out Donnie Smith Show and War of the Twins Kick Off 2018 Riding Season in the Sturgis Rider News Blog.